I'll be completely honest when I say that I wouldn't have to hear a single cut from the upcoming third record from JoJo and I would still purchase it outright. Jumping Trains has been withheld from us for what feels like eons -- and if it feels like that to us, I can only imagine how creatively frustrating it must be to her. JoJo is one of those few and far between pop artists that popped onto the scene in her early teens back in 2004 with a urban-tingled first single and a huge voice to back it up. Despite being so unfathomably young, she was rocking it out on stage with searing vocals, telling her BF to get the eff out if he wants to cheat. The first time I heard the song, I had no idea who the singer was, but I knew it was someone I could hang with. Come to find out, she was three years my junior...and I was 16. Take one listen to her 2004 debut, JoJo, and try and tell me it doesn't blow your mind this girl was just 13 when she recorded it. There are popstars now who only wish they could sound as legit as JoJo did then. Now a sophomore record and a mixtape down the park, we're still waiting for Album #3. She's come a long way from her "Leave (Get Out)" days of yore, but has remained just as real and vocally competent as she was then -- taking control in terms of songwriting, creating songs that she wants to create and can personally relate to. 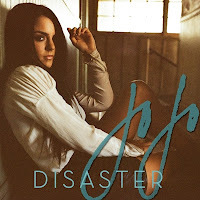 As Jumping Trains (formally titled All I Want Is Everything) begins to solidify into reality's release schedule, JoJo finally hopped back on the official promotion train, opening up for Joe Jonas and Jay Sean during their recent US jaunt in support of her official first single from the project, "Disaster". "Disaster" is familiar territory for JoJo, as it harkens toward what has already worked (on the radio) for her. It's the 2011 equivilant of "Leave (Get Out)" or 2006's "Too Little Too Late". It's a heavy-handed, melismatic fun fest set a singing mid-tempo. While it was her project's lead-singles that tended to give her commercial success, it was her more adventurous, but still urban-twinged pop, that I adored more, and a lot of that was put on glorious display on her sophomore album, The High Road ("The Way You Do Me", "Let It Rain", "This Time", etc. ), so I knew that as much as I liked "Disaster", the best was still yet to come, and I was right. I can't get over her voice. She sounds so clear and incredible live. She sounds better than the record live. Unbelievable. Dear Jumping Trains, coooommmmmeeee to me. I can't WAIT for this album to come out! Although, I don't agree with the release of "Disaster" as the first single. Sure, it's a good song, but it doesn't read radio hit to me. And what that girl needs is airplay. Anyway, I'll keep blasting Can't Take That Away from Me as loud as ever, 'til we finally get to jump some trains.